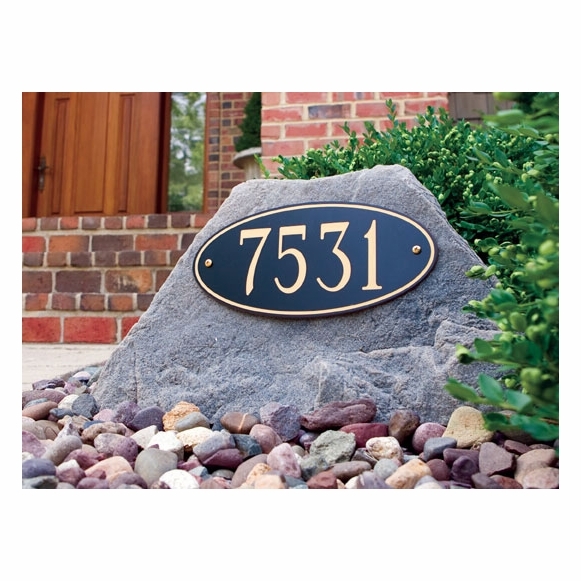 Personalized Address Rock - - artificial rock enclosure adds a touch of class to your landscape. This small hollow mock rock has a flat face for the address marker. Personalized rock can also be used to conceal smaller items such as outdoor outlets and septic cleanouts. These faux rocks are made with textured RealRock™. The varigated rock-like surface realistically blends in with other natural textures. RealRock™ rock enclosures are made in the USA from recyclable materials. Made of lightweight, durable RealRock that is virtually indistinguishable from a real rock. Patented flange design secures the enclosure to the ground. Includes two heavy-duty ground stakes. Available in two colors: riverbed and fieldstone. Riverbed is variegated brown with rich combinations of natural dark tones and multicolor highlights. Fieldstone is soft gray with natural tones and multicolor highlights. Oval address plaque is 12"L x 6"H and comes in two color combinations: black face with gold characters and black face with silver characters (not shown). Dimensions: 24"L x 12"W x 12.5"H (note: length & width are taken at the base; height is the highest point). Weighs 2.5 pounds. PLEASE MEASURE the device you need to conceal carefully before ordering. Note: Because the rock shapes are irregular, measurements should be used as a guide only. If you are uncertain as to which rock to order, please send an email to customer service. Please tell us the type of object you will be covering and its dimensions. Made in USA of recyclable materials. Custom made for you. Please allow 2 to 3 weeks for delivery. Bought this to cover a well pipe. The gray wih black/silver plaque very crisp and classy looking. Reasonably priced-I saw some as expensive at $300-and great looking.